A full migration to Workplace"Workplace" describes the Autotask Workplace service in its entirety. means that the current data set will be synced to the Workplace service and thereafter decommissioned, leaving Workplace as the sole data storage location. Start the process by installing Workplace DesktopAlso known as the Workplace Desktop app, and in the context of this documentation, simply "the app," Workplace Desktop is the software installed on a computer that is responsible for synchronizing data between the local drive and the cloud. on the machine(s) that currently host the data or have fast access to the data and will be (temporarily) dedicated to upload data to the Workplace service. If the machine(s) will be dedicated to uploading the data set, use as modern and high-spec a machine as possible, with a fast connection to both the Internet and the data storage. Download the appropriate (Windows or Mac) version of Workplace Desktop from the Download link on the Workplace Login page. Copy the installer to a network share available to all team members or to an external storage device in preparation for step 4. Install Workplace Desktop on a machine that will (temporarily) be used exclusively to upload the data set, and enter the Workplace credentials when prompted. The user account with which Workplace Desktop is associated must have full access permissions to the entire folder structures that will be synced. This refers to the local permissions - not the Workplace permissions. Workplace Desktop must be installed using an Workplace account with Administrator privileges. Workplace Desktop can be installed on multiple machines and simultaneously upload separate projects to reduce the total upload time. This step assumes the data has already been structured as outlined Before You Begin: Projects. By default, after installation of Workplace Desktop, a Workplace folder is created within the user folder which Workplace Desktop is associated. Folders (which will become projects) can simply be moved into the Workplace folder, which will cause the files to automatically start syncing up to the Workplace service. Alternatively, when moving or copying to the Workplace folder is inconvenient, use the Folder Sync Tab to sync folders from their current location by selecting the Create ProjectA project is a top-level folder within Autotask Workplace. A project is the primary container for all the folders and files that are synchronized by the Workplace service. Projects create the basic organizational structure to store data and control user access. from local folder option. Wait for the key projects to fully upload before continuing. Less critical projects can be uploaded and shared in conjunction with subsequent steps or at any point. If uploading the key projects first, continue with the remaining steps after the upload of these key projects is complete then repeat steps 2, 5 and 6 for the subsequent projects. Be aware it may take a long time to upload the projects, depending on size and file count. As each file needs to be linked with its counterpart on the Workplace service, there is an overhead for each file. The effect of this is that a large amount of small files may have a small total file count, but may still take a long time to sync as it performs the necessary actions on each file. Taking this into consideration, it would be expected for a 5GB Project containing five files to upload much faster than a 1GB Project with 50,000 files. While the data is uploading, you can proceed to set up the Workplace team. We recommend waiting to create users until the primary data is fully uploaded. As an initial step, set your TeamA team is an entity, usually a company, which subscribes to the Workplace service. A team is made up of members and connections. Defaults and Policies. For more information, see Policy Profiles. After users have been added, they will receive an email with instructions on how to activate their accounts (unless the Restrict Welcome Emails to Admin policy is enabled). 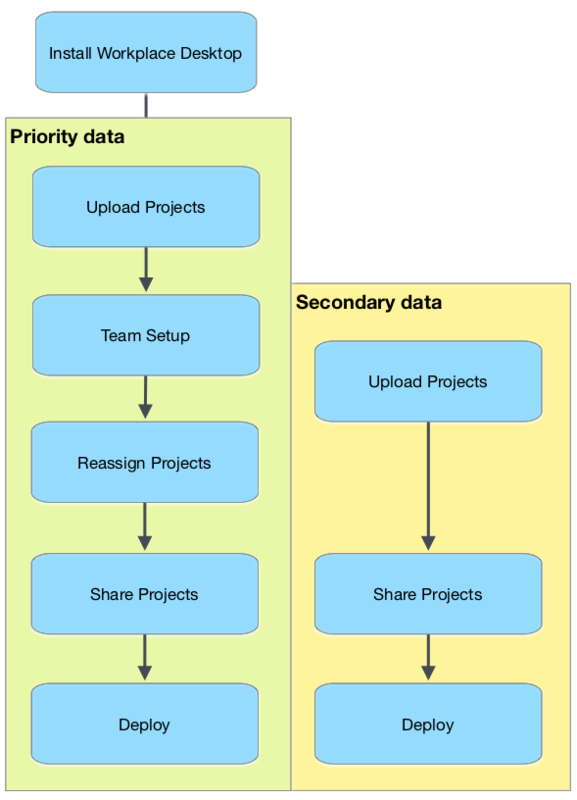 Assuming the uploaded projects (as described in step 2) were synced using the Administrator's account and that the Administrator should not be the project owner, reassign the projects to the appropriate owners. Refer to Project Detail for more information. Unless the Restrict Welcome Emails to Admin policy was enabled, users would already have received the welcome email and, most likely, activated their accounts. Upon activation, Workplace Desktop will automatically download. Users can also download the appropriate (Windows or Mac) version of Workplace Desktop from the Devices tab. If the welcome emails were disabled via policy, you can now forward the activation link to the users. Remember to disable the Restrict Welcome Emails to Admin policy if desired. As a result of deployment, users will receive an email in which they must approve the device and accept the EULA. Take this into consideration when you decide when the send the welcome emails.